Nothing like the twinkling stars and glow of excitement at this time of year! Not the Holidays, I'm talking Golden Globe Nominations! I've seen everything in the Drama category except The King's Speech which I plan to see next week, but I can't imagine that it will change my vote for Black Swan. Comedy or Musical - They've included Burlesque only because it is a musical, they did the same thing with Nine last year. Although, I personally felt Nine deserved a nomination. I was supposed to see The Tourist this past weekend, will see it this coming weekend, but I'm having a hard time believing this is the best Comedy of the whole year? What about Cyrus? or The Extra Man? These films were truly original and very funny. Actress - I just saw Nicole Kidman in The Rabbit Hole last night (check back for review). She's just a slightly more fragile version of her usual self. Jennifer Lawrence in Winter's Bone, however, is fierce! She should win hands down. Supporting Actress - Again, without having seen The King's Speech and I don't know who Jacki Weaver is and I've read nothing, heard nothing about Animal Kingdom. So I'll go with Melissa Leo, she plays a tough as nails, working class, Kris Kardashian wannabe in The Fighter. 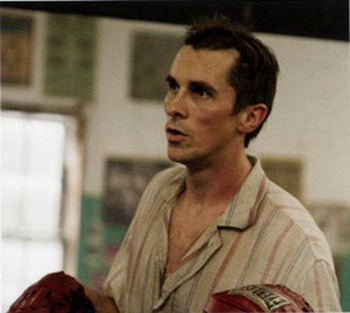 (note: My co-blogger at PFS and I are splitting up blogging duties on the films with Oscar buzz, so he's going to write about The Fighter and I choose The Rabbit Hole for this week). Supporting Actor - Up until now, I would have gone with Jeremy Renner in The Town, but Christian Bale is living, breathing and starving in his role as a strung out, has been brother in The Fighter, it's worth seeing this film solely for his performance. Screenplay- Aaron Sorkin for The Social Network. I saw some of the interview with Mark Zuckerberg and even though he talks about the inaccuracies, you still got the sense that he felt it was a pretty darn good movie. And it is. Jessie Eisenberg is perfectly cast, but the real star of the film is the believably witty dialogue and the unfolding of the tale. Director - Normally, the best film should go to the director of that film, so if I'm choosing Black Swan, I should choose Darren Aronofsky, but Inception is much more complicated in terms of shooting, so I'm going with Christopher Nolan. Mark your calendars for Sunday, January 16th!